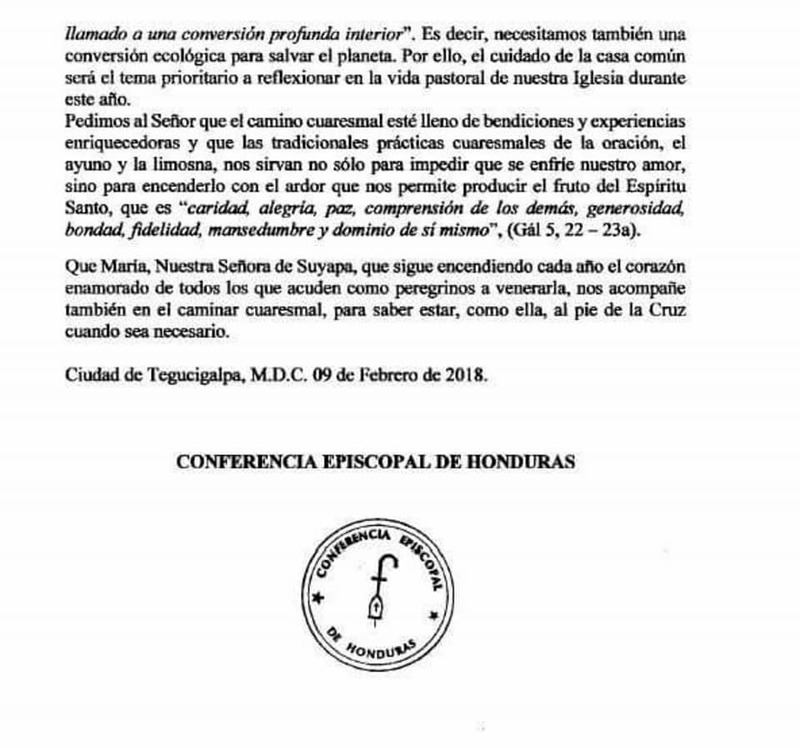 The Honduran Bishops Conference issued a Lenten message for 2018. The original can be found at the end of the document which is my translation. 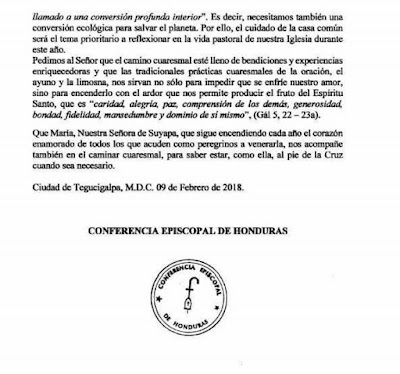 As we conclude the ordinary meeting of the [Honduran] Bishops Conference, we, the bishops of Honduras, wish to share with the People of God the fruit of our reflection and, at the same time, call them to live the path of Lent with renewed faithfulness to the Lord. Following Jesus in his path toward Easter, Lent offers us the opportunity to renew our mind and our attitudes, guided by the values which moved Jesus to fulfill his Mission of offering salvation to all humanity. The Lord Jesus invites us to be converted to the Truth; he himself came to the world to be the witness to the Truth, as he affirmed before Pilate, adding: “Everyone who belongs to the truth hears my voice” (John 18:37). Conversion to Truth means accepting that only in the Lord is the full truth; to accept that none of us possess it completely; and that in others there is part of the Truth. That conversion moves us to accept that by means of dialogue we can gain access to new horizons of mutual understanding. Lent is a path of conversion to social justice, by which we go forward constructing the Reign of God and which demands that society and the state struggle against corruption and impunity and reject every violation of Human Rights, especially the right to life. 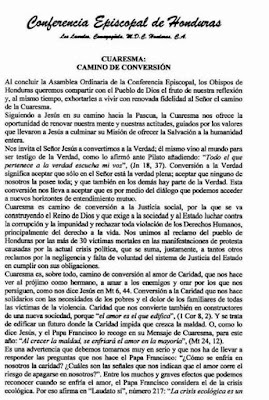 We unite ourselves to the complaint/protest [reclamo] of the people of Honduras for the more than 30 victims killed in the protest demonstrations caused by the present political crisis, which is justly added to so many complaints/protests [reclamos] for the negligence and lack of will of the state's justice system to fulfill its obligations. Lent is, above all, a way of conversion to the love that is Charity, which makes us see the neighbor as brother [or sister], to love enemies and pray for those who persecute us, as Jesus says in Matthew 6:44. 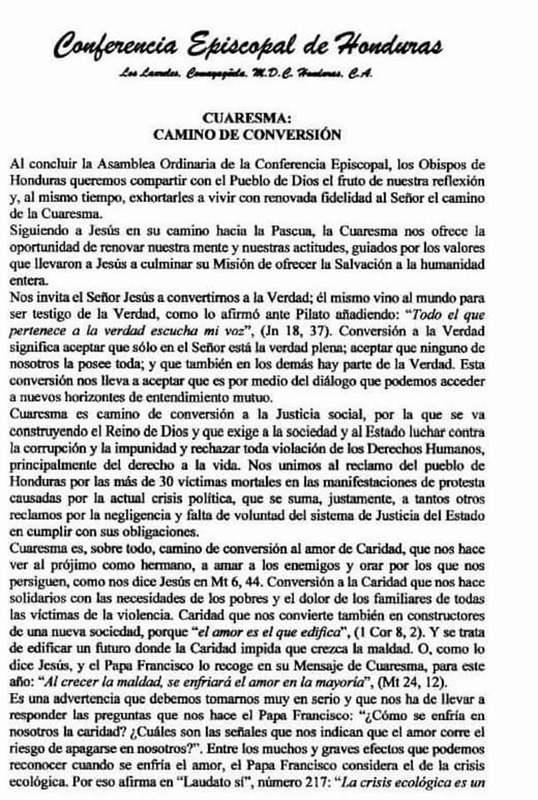 Conversion to Charity puts us in solidarity [nos hace solidarios] with the necessities of the poor and the pain of the families of all the victims of violence. Charity which also converts us into builders of a new society, for “It is love which builds up” (1 Corinthians 8:2). And it is about building a future where Charity gets in the way of/blocks [impida] the increase of evil. Or, as Jesus says and which Pope Francis recognizes in his Lenten message for this year, “As evil grows, love gets cold in most all the people” (Matthew 24: 12). This is a warning which we ought to take seriously and that should move us to respond to the questions which Pope Francis gives us: “How is charity growing cold in us? What are the signs that show us that love runs the risk of being turned off in us?” Among the many serious effects which we can recognize when love grows cold, Pope Francis considers the ecological crisis. Therefore he affirms in Laudato si’, number 217: “The ecological crisis is a call to a profound interior conversion.” That is to say, we also need an ecological conversion to save the planet. Therefore, the care of our common home will be a priority theme for reflection in the pastoral life of our Church this year. We ask our Lord that the Lenten path may be full of blessings and enriching experiences and that the traditional Lenten practices of prayer, fasting, and almsgiving will serve us not only to prevent [impedir] our love growing cold but also to inflame it [our love] with the passion [ardor] which lets us produce the fruit of the Holy Spirit which is “charity, joy, peace, understanding of others, generosity, kindliness, faithfulness, meekness, and self-control” (Galatians 5: 22-23a). May Mary, Our Lady of Suyapa, who every year continues to inflame the hearts full of love [for her] of all those who gather to venerate her, accompany us also in the Lenten journey so that we may be, with her, at the foot of the Cross, when it is needed.